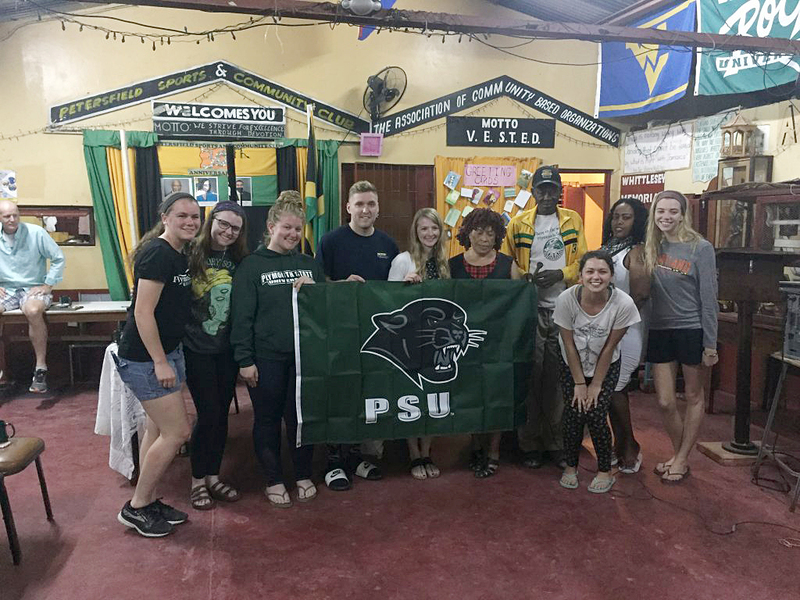 On Sunday, January 8, six Plymouth State students and their instructor, Jessica Dutille ’03, ’04G, boarded a plane bound for Jamaica, leaving the remnants of a snowstorm behind them in favor of a week of sun and 80-degree weather. But this was no vacation. 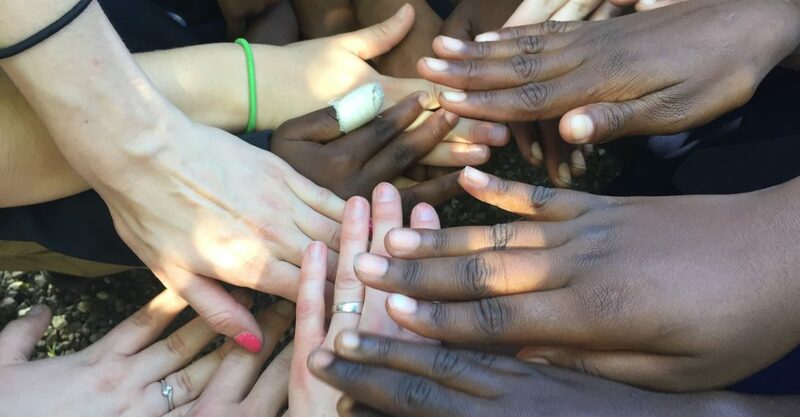 This was a service-learning trip in which Dutille, an instructor in elementary education and childhood studies, and students in her Mentoring and Empowering Youth course provided assistance to the small, rural community of Petersfield, located about 20 miles inland. For decades, Jamaica has struggled with slow growth and high debt, and it continues to deal with high unemployment and poverty rates. Over the last 30 years, the real per capita Gross Domestic Product (GDP) increased at an average of just one percent per year, making Jamaica one of the slowest-growing developing countries in the world. 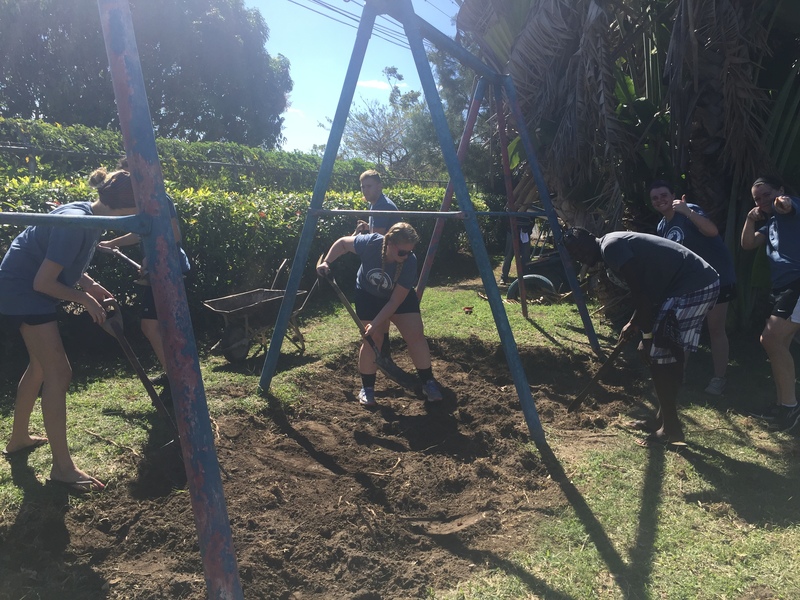 Thanks to global service-learning organizations such as Amizade, a PSU partner that facilitated this trip, volunteers are omnipresent in Petersfield and in similar communities throughout Jamaica. The PSU group met other students from Slippery Rock University in Pennsylvania and Stevenson University in Maryland who were also volunteering for the week. 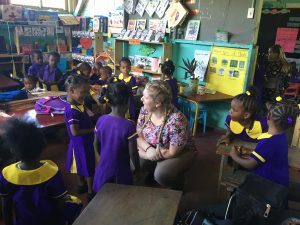 Over the course of their week-long stay, the students supported teachers, taught classes, and provided one-on-one tutoring to children in the local primary school, helping them build their confidence in areas such as reading and math. They also introduced the children to American culture through songs and games. And they worked with community volunteers to make the community park safer and cleaner. What the students gained in return is a better understanding of the Jamaican culture, a greater sense of their abilities and passions, and the realization that they can make a difference in the world. Service-learning trips in which both students and the communities they serve benefit are emblematic of the University’s new integrated clusters model that combines multidisciplinary learning and practical application to find solutions to real-world problems. “There’s a lot of power in coming together from different disciplines and pooling our experiences and viewpoints to tackle societal issues,” says Dutille. 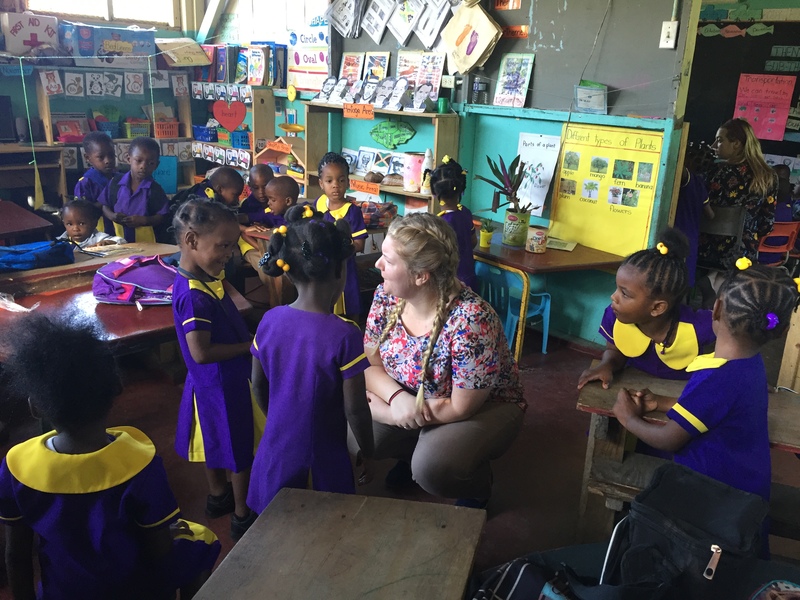 Olivia Kelly ’19 with students in the early childhood classroom at the Williamsfield Primary School. 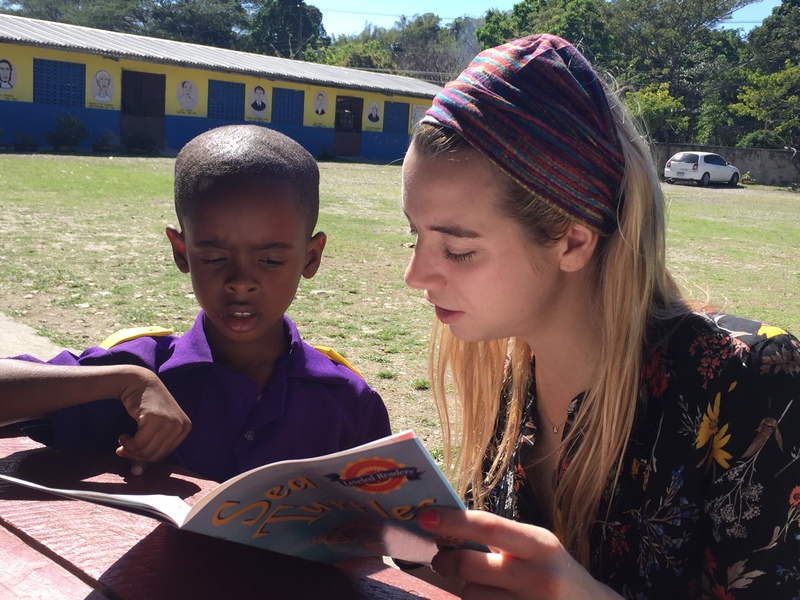 Nicole Lund ’17 reads with a student at the Williamsfield Primary School. Working in the community park. Throughout the week, Dutille encouraged her students to take time to reflect on what they were doing and why. While the students were gratified to know that they were addressing real needs, gaining invaluable hands-on experience teaching and collaborating with community members, and immersing themselves in a totally new environment and culture, she says it was the relationships they formed with their host families, and the children and teachers in the schools, that had the greatest impact on them. “We may look different, we may be from different cultures and environments, but we’re really all the same–we’re all citizens of the world,” Dutille says. For the six students involved, the trip, which concluded on Saturday, January 15, is a gift that keeps on giving. The spring semester will hold opportunities for them to share what they’ve learned with other PSU students as well as with students in schools throughout the community. 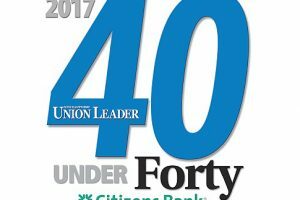 And they’re eager to find opportunities to serve and support their own communities, as well as Plymouth. All photos courtesy of Jessica Dutille. Dutille and her students presented the Association of Clubs with a PSU flag. From left: Ashlyn Szabo, Emily McLaughlin, Olivia Kelly, Kyle Kosiorek, Jessica Dutille, Phillipeen Spence, Matthias Brown (director of the Association of Clubs), Taylor Fournier, Antoinette Staple (Association of Clubs), and Nicole Lund.